I want to say "He who controls the random thoughts controls the universe", but if they're controlled, they're not really random. Here, Damien G. Walter, welfare leech pretending to be a writer (no seriously, the UK government gave him a grant to write a novel—and elsewhere on that blog, he attacks the idea of writing as a business, i.e. as a legitimate trade), complains that superhero teams are never more than 1/4 female. The implication—couched as it is in terms of "women are half the population"—is that this is unrealistic. But...police forces are 12.7% female (in terms of officers with arrest powers—a higher percentage of their total employees are female). That's 1/8. The active-duty military is 14.2% female. That's about 1/7. So actually, what's "unrealistic" is that superhero teams have too many women, not too few—out of every 200 characters in both big houses' rosters (that's probably close to the number of characters actually showing up in comics at any given time), only twenty-seven should be female! Alternatively, if we assume that superpowers cause twice as many women to enter that kind of work, then comic books are right where they should be. It occurs to me that an idea many people have about Japanese philosophy may be due to a mistranslation. I noticed this watching...I think Gurren Lagann?...where something like "sore wa ore no shinjitsu" was translated as "that's my truth". But...that's not what it means. Japanese has to say things like "shinjitsu", literally "belief-truth" or "belief-fact", for the very simple reason that they don't have relative constructions—"shinjitsu" means "what I believe". If one prefers a more literal translation (which in this case also captures some of the word's broader connotations), go with "credo". It has been remarked that Arcee, in Transformers Prime, is too damn big for her vehicle mode. It's simplest with a visual aid. See? One of her calves, maybe, being generous, one of her legs, fits inside that bike. The rest of her? Hell no. So I crunched some numbers. We can actually assume that a Cybertronian is only as dense as a human, rather than as dense as automotive alloy, since they have a lot of empty space inside for their parts to move through when they switch modes. But supposing we take a very big bike, like say a Yamaha XV1900A, the biggest bike Yamaha makes. It weighs 329 kilograms. Now, assuming that Arcee is proportioned like an average woman (which my back-of-the-envelope calculations say is, globally speaking, 160 centimeters and 56.4 kilos), we get an Arcee who stands 288 centimeters—i.e. 9 feet 5 inches, instead of probably almost 20! You want her bigger, guys, well, make her a damn car like she's always been. Incidentally, while we're on the subject, the helicopter Airachnid is obviously based on, the RAH-66 Comanche (which didn't get picked up), weighs 4,218 kilos. That means she should be 2.34 times as tall as Arcee. Of course, along with Arcee being too big for her vehicle mode, Starscream is too small, both in G-1 (which doesn't give a tinker's damn about scale) and in Prime (which sort of does, a little). Starscream's alt mode in Prime is an F-16 Fighting Falcon (with the VIN numbers melted off); it's 700 kilos lighter than his G-1 F-15 Eagle alt-mode. But that still means he weighs 12 megagrams. Knockout, for example, is basically an Aston Martin DB9, with a curb weight of about 1750 kilos; taking the cube root of their mass difference, Starscream should be 9.6 meters tall, 89% taller than Knockout, not "about a head" taller. Knockout and Bumblebee are also probably too big; the mass ratio of an Aston Martin or a new Camaro to a human gives a height of 5 meters; they're both more like 8. 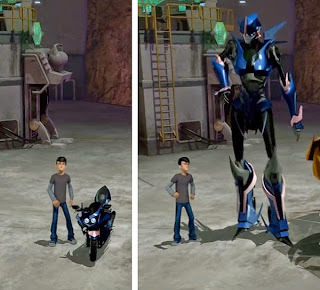 Optimus, too, is sized weird—given that a Peterbilt 379 masses about 8,200 kilos (depending on engine and a couple other variables), he ought to be 70% taller than a car-bot—8.45 meters—but that's 12% shorter than Starscream. Megatron probably can't be the same size as Optimus, because he has to be bigger than Starscream. Maybe give him a Hind attack helicopter vehicle mode, half again as heavy as Starscream? That'd make him 16% taller than his Air Commander (31.7% taller than Optimus), at 11.1 meters. I wonder if the way English's appositional phrases and relative constructions work, is related to the fact that older Indo-European languages were much more "right-branching" than English is today. Indo-European languages used to put adjectives after nouns, the way English still puts adverbs after verbs (of course, most of the Romance languages and Celtic languages still usually put adjectives after nouns, as do Slavic ones when the adjectives are genitive noun-derivations; and all the Scandinavian languages, and Romanian, use a suffix for the definite article). Putting anything but numbers and prepositions before nouns is an innovative structure, in Indo-European, and most things still actually work the other way. Has anyone noticed that the elephant in the room, in every discussion of "mind uploading", is that—leaving to one side the issues of the Lucas-Penrose Argument and what it says about the limits of machine logic—any device you can upload your mind to, would have to constantly emulate your original hardware? And seriously, know what the biggest difficulty in any emulation is? "When the exact behavior of the system to be emulated is not documented and has to be deduced through reverse engineering." That's from the Wikipedia article on emulation. It goes on to say, "if the emulator does not perform as quickly as the original hardware, the emulated software may run much more slowly than it would have on the original hardware, possibly triggering time interrupts that alter performance". Do you want those to happen to your mind? The whole dream of mind-uploading is about transcending the limits of your flesh (because, again, Transhumanism's just a new flavor of the same age-old Gnostic angelist millennarianism). But the human brain carries out trillions of operations every second; the rate of neuronal firing is estimated by neuroscientist Astra Bryant to be in the range "86 billion to 17.2 trillion" (gee, our knowledge of the brain's operation is so precise, mind-uploading can't be far off now! ), while the rate of synaptic firing is in the range "100 trillion to 20 quadrillion" (for those playing along at home, that's a range 19.9 quadrillion wide). Pretending that one neuron or synapse firing is comparable to a single floating-point operation of a microprocessor (and it isn't), we're talking about 10.058643 petaFLOPS, which is pretty much at the limit of our technological capability. On average. The maximum—and remember, these are ball-park figures, the brain probably goes significantly higher when it has to, remember how many synapses there are, and the fact we haven't even gotten into glial cells—is 20.0172 petaflops, which is more than all but exactly one supercomputer, ever built, is capable of. And oh, by the way, that's just "floating point operations". It is, again, probably more realistic to map every cell and synapse as a single line of code—and there can be thousands, occasionally millions, of floating point operations in a single line of code. The very cutting edge of our technology is just barely adequate to the absolute most minimalistic representation of our brains; it falls stupefyingly short of more realistic modeling. Stuff about space. This is post 515, which is 103 × 5. I redid that thought experiment about a fusion-rocket Blackbird—I was able to find more specific information about its mass-ratio. It turns out, an SR-71 Blackbird weighs 60,000 pounds without fuel, and its fuel weighs 84,180 pounds. That means it has a mass ratio of 2.364. If you built a magnetic-confinement fusion ship with that mass ratio, it'd get you up to 1.17% of the speed of light (assuming you like to stop at the end). And if your rocket engine is the same size as the Blackbird's (9 times as massive as the minimum size for an MC fusion engine), you get 168,750 newtons thrust. Unfortunately that can only accelerate a fully-loaded Blackbird at 5.35 m/s2, which comes to .545 g's. Two other changes occasioned by my spin-gravity research. First, I think I might make the human "space fighters" (which are really parasite missile-ships launched from a mother ship) more like Orion-type ships, rather than the long skinny dragonfly-shaped design of most human ships. They'll probably replace the "big steel wall" pusher-plate with a magnetic field, though, proton-chain fusion involves a hell of a lot more energy than a hydrogen bomb. This lets them be a lot smaller than even the smallest Orion ship, since a major portion of the mass of those is the pusher-plate. Second, I'll need to figure out how to describe the distortions created, in the topology-sensors the zledo use, by artificial-gravity inertial protection (they bleed the force of accelerations into the surrounding space-time). I think, if they accelerate at 8 gs, their ship, or part of it, would seem to stretch eight-fold in the opposite direction. It occurs to me whenever I posit a technology like this, to worry about the environmental impacts—but there's plenty of asteroids thousands of times bigger than any ship, and the gravitational perturbations they cause are infinitesimal. One of the articles I read about cats in free-fall had numberless comments (I think because it was a British site—maybe even a Daily Mail article?) about how "cruel" that was, and how if you want to study the effects of free-fall, you should study it on humans (yes, they ignored the fact there were humans free-falling right there with the cats—it was on the Vomit Comet, they didn't just turn the gravity off for the cats without becoming weightless themselves). But the point of studying free-fall's effects on cats is, humans do not have that kind of righting instinct. Cats do. You can no more use humans to study how that righting reflex works in free-fall than you can use them to study tails or retractable claws. Come to think of it, it was definitely a Daily Mail article; one of the other commenters was some idiot identifying the blatant, obvious, familiar-to-anyone-who's-seen-I Dream of Jeannie 1960s USAF uniforms as Soviet Army uniforms, and saying that this "inaccuracy" showed the Mail was making the whole story up. But, uh, mate? Aside from how, whoever did the film, there's free-falling cats clearly shown, 1960s Soviet uniforms were olive drab (Army) or black (Navy), not blue, and outside the Navy they had Sam Browne belts, with the shoulder strap, up till at least the Afghan war. They also had "peaked" hats (as your distorted, decadent dialect calls 'em, for no reason—a "peaked" hat would be pointed, if you mean "beaked" maybe you should say it), known in the civilized world as combination caps. The guys in the video in question were wearing "side caps", AKA garrison caps, AKA "flight caps", because they were freaking USAF officers. It's practically impossible to get the two confused, without actual effort. Been looking into SSTO vehicles. When I switched it so none of my ships landed, I decided the Japanese guy's ship used an SSTO entry-vehicle as its habitat section—which, I find, is something that ought to be known as the "Kankômaru" type. The dimensions of mine are a bit different—it's smaller, and has several actual cabins, rather than an airline-type "theater seating" setup—but the principle is the same. I find the same thing was proposed by Chrysler in 1971, as the SERV ("Single-stage Earth-orbital Reusable Vehicle", which says "SSEORV" to me but whatever). The SERV was actually put forward as an alternate to the Space Shuttle. And not picked. Somehow. There's also the SASSTO ("Saturn Application Single-Stage to Orbit"), by Douglas, from NINETEEN SIXTY-SIX—it was claimed to be derived from Saturn rockets but basically the only way that's true is it could launch from the same facilities. From the same company, a quarter century later, we get the Delta Clipper, which in its final form as the DC-Y DC-I was supposed to be commercial spaceflight like grownups would have, with spaceports throughout the country and flights regulated by the FAA. Not to be, sadly. SSTO ships are interesting, because they are ships with extremely high mass ratios and yet they accelerate at very high rates. The DC-I DC-Y (an intermediate form of Delta Clipper, from the study) would accelerate at 11.34 m/s2, with a mass ratio of 13.05; a SASSTO would accelerate at 12.59 m/s2, with a mass ratio of 14.68; the SERV has 12.64 m/s2 and a mass ratio of 9. These are ships that land, too; you could almost certainly push the mass ratio even higher in vacuum. So, why, exactly, are we always being told to keep our mass ratios under 5 or 6 or so? Significantly higher ones can be sustained. Of course, there may be other reasons not to use that kind of mass ratio. I don't use it in my books (I go with the "under 5 or 6 or so" one) because the speeds my ships need, due to the time-frames involved, require proton-chain fusion rockets. And with a proton-chain fusion rocket, even a SERV's mass ratio of 9 gives you a cruising speed of 10.99% c! Sure, that gets you where you're going faster—but you have to circle the block a couple times to slow down. See? Acceleration vs. delta-v is an essentially unsolvable conflict in spaceship engines. Whatever time you save increasing your Δv, you might well lose it back in the time it takes your engine to accelerate to that speed. Obviously, this doesn't matter for long-haul interstellar flights taking decades or centuries, where days, weeks, months or even years of acceleration make up a small component of the total time—but when your setting includes FTL it feels very inelegant for starting and stopping to be the longest part of any space-journey. Honestly, get off the reservations built for you by Christ and Buddha; at least look at the world through the eyes of an Orthodox Jew or a conservative Hindu. Better, go find some Neolithic subsistence-agriculturalist who lives in abject terror of saying or doing the wrong thing, intentionally or not, and ruining his luck. The Navajo are a good choice, there's a quarter million of 'em and their purity-code's been extensively studied. Traditionally, they will not build with driftwood or look at corpses or let dogs in their houses during storms or be in the same room as snakes or speak of the dead or dance with someone who has the same surname as any of their grandparents or play "cat's cradle" outside of winter; they live in one of two kinds of shelters, which they switch between at set points during the year, and they build them according to a strict geomantic formula and with every component strictly determined by ritual laws. That about the kind of discipline necessary to maintain a space-habitat? Well good news, everybody, that is "normal", historically and, even now, statistically, for the human race. Maybe that mindset can't build rockets—but they can definitely crew and maintain 'em, better than your precious "freedom-loving" Belters ever could. Alternatively, the fact that you need to adopt a Neolithic purity-code mindset to safely maintain a space-habitat, might be an excellent justification to have future space-colonies, in defiance of Tsiolkovsky, Heppenheimer, O'Neill, Niven, and all the rest, living primarily on planets, rather than in artificial habitats. Because no sane person, having been freed from the purity-code, voluntarily goes back to it—it's just too much damn trouble. That's why "neo-pagans" have about as much in common with historical paganism as William Stukely. The "4% a year" number, considered to be the likely rate of increase of the population of space, is also the average of the growth of Australia's non-aboriginal population since 1787. It's harder to track the population of the Americas, since the English colonies didn't have extensive censusing and there's no legitimate reason to restrict the French or Spanish ones to non-aboriginals—but it's practically impossible to track all the Indians' populations (plus, you get negative growth, thanks to epidemics). The peculiar character of Australia's colonial history makes it a more convenient model of space-colonization, in quite a lot of ways—not only are the numbers easier to find but the actual setup of the Australian colony was more like what you'd see in space, than any of the New World colonizations (or Africa, for that matter). I have a feeling that, given the average hydrogen atom in a star survives for millions of years before ever undergoing fusion, the proton-chain fusion rockets in my books are probably actually catalyzed by the CNO cycle, as Bussard recommended for his eponymous ramjets. Only my rocket engines do not simply slam the stuff they're fusing into a funnel at relativistic speed, they compress it with a combination of magnetic fields and an application of the direct topological gravity-control. I think, thus, that the full name of the system would be "CNO-catalyzed topological confinement proton chain fusion". I think they just call it "proton-chain fusion" rather than, say, CCTCPCF, or (with some liberal sprinkling of hyphens and a broad interpretation of "hyphenation makes it one word instead of two") CTPF. In the paper I got the idea of metric-patching from, objects inside a ship with a metric-patching engine are described as accelerating with it, "in a weightless state of free fall", which presumably means that they retain their ordinary inertia relative to the ship's frame (basically, the ship has become the sole "geodesic" reference frame with any meaning directly relevant to its occupants). It might be possible to induce a topology, within the spherical frame of the ship, that causes directional acceleration for the occupants—true artificial gravity—even while the metric-patching is active. Presumably it uses a very different topology than a non-metric patching ship's artificial gravity; it'd probably also not be a function of the metric-patching, but an independently created effect. Still, the speculation was useful, in that it got me thinking about zled ships' layout and dimensions. It made me figure out how much volume it takes to hold a given collection of missiles and parasite craft...and large predators. Eventually I get a ship with a diameter of 61.49 meters, which sounds tiny till you crunch the numbers and notice that means a volume of 121,723.57 m3. It masses about 8,100 megagrams. Its parasite-craft are 7.12 meters in diameter, while its entry vehicles are 8.21. I get the volume numbers and masses by comparing the mass and volume (usually fudged a bit) of real-world craft, compared to the volume of my ships; I'm keeping some of 'em close to the chest but I will say the entry vehicle is approximately the volume of Virgin Galactic's "Spaceship Two"—since it's an 8-seater space-plane. Thoughts on speculative fiction. Mostly science fiction but there's a couple about fantasy. 513 is 33 × 19, which makes it a Harshad number in base-10 (numbers divisible by the sum of their digits; 5+1+3=9). You know the super-robot anime trope of the person that stands in the giant robot's hand? Well, I did some computing of the minimum size for a palm to support a person. Minimum standing area for a person is .6 meters, or 6.46 square feet, or a square 77.46 centimeters or 30.5 inches on a side. The area of the human palm is .5% of the surface area of the body, and the average surface area of a male human body is 1.9 square meters, or 20.45 square feet. .05% of that is 95 square centimeters (.0095 square meters), or 14.73 square inches (which is also .1023 square feet). Dividing 20.45 by .1023 (the area ratio of "standing space" to "palm area"), we get 24.85—so a figure with palms large enough to stand on must have 24.85 times the area of a human body. Area varies as the square of single dimensions, so the minimum size for a giant robot to have someone stand on its palms (the square root of 24.85=)4.985 times the height of an average human male. The average human male (globally) is 68 inches or 172.7 centimeters tall, and 4.985 times that is 28 feet, 3 inches, or 8.61 meters. Assuming the approximate density of automotive magnesium alloy, which again makes an average man mass 119 kilograms instead of 70, the robot will mass 14,746.18 kg, or 16 short tons, 509.8 lbs. I know I've mentioned that the "thieves' guilds" and "mages' guilds" in a lot of fantasy RPGs, aren't really guilds. The mages' ones at least do have apprenticeships, which most thieves don't, but prospective members don't need to submit a masterwork to get in and they very rarely offer insurance. It's worse in computer RPGs, where the "guild" is the thing through which professionals are hired (guilds didn't do that—again, you don't contact the ADA when you're looking for a dentist) and they seldom even organize around a particular craft. That's no kind of a guild. (They're also not anything like an "order"—the "Order of the Stick" is not a vowed lay or monastic brotherhood, military or otherwise, therefore it should be called something else.) No, what the adventurer-group in a computer RPG is, and what many little bands of adventurers in the tabletop games often are, is basically similar to the mercenary companies of the late Medieval period and after, albeit with more sua sponte work and in more fields than the purely military. I personally hate the convention of actually referring to the adventurers, in-world, as "adventurers". "Adventurer" is a word with very bad connotations—it's something along the lines of "bounder". Plus, nobody actually doing the things would regard them as "adventures". "Explorer" is probably closer, given what they do (and their dungeon-delvings, thus, are "explorations"); if one wanted to highlight the similarities to mercenary companies, I suggest something like "contractors", or some synonym (the actual literal meaning of "condottiero" is "one who conducts [war]", much like calling a mortician an "undertaker [of embalming]"). Of course, I realize as I write that, the underlying objection is that I don't like RPGs that feel like games ("I don't want dreams where it feels like I'm dreaming"). So, for instance, I dislike most recent fantasy anime and manga, since the characters all but talk about literally leveling up and having hit points. Fairy Tail, and the many series that are obviously knockoffs of Fairy Tail, would be the prime offender there (meanwhile, Lodoss War doesn't do it, despite having originally been an actual transcribed D&D campaign). Might give the khângây handheld coilguns, after all, instead of electrothermal-chemical. Coilguns (or Gauss guns) don't have the issues railguns do, namely needing a hugely long barrel. A quick survey of the web with my peerless Google-fu reveals an approximate equivalency between total muzzle energy and the power requirements of the coilgun, so it doesn't need weird little slivers at hyper-velocity, it can just use regular bullets and normal muzzle energies. Actually think I'll call theirs "quench guns", which is the term for superconducting coilguns (even though the khângây model probably uses "hot" superconductors, they're usually still pretty cold—"hot" is relative to "below 30 Kelvin", which is what metal superconductors need). Still torn as to whether I ought to call the ones the humans use—that rotate between barrels to save wear on the components?—"coil vulcans" or "Gauss vulcans". The former seems more technical; the latter has more of a science-fictional pedigree. Then again, avoiding the science-fictional term and saying something else (not "holograms", "volumetric displays"; not "cyborg limbs", "prosthetic enhancements") is how I roll—because you want people to look at the thing, not their memory of tropes about the thing—so I guess "coil vulcans" it is. Then again "vulcan" is itself a science-fictional term, for what would probably be more correctly called a "Gatling autocannon" or "minigun" (depending on caliber)—but it's primarily used in Japanese science fiction, so my English-language audience wouldn't have too many tropes associated with it. In light of the extreme energies possible by putting explosives in one's rounds, I'm upgrading zled high-end powered armor (as used by their regular military rather than civilian emergency levies) to STANAG 4569 Level 4—it had been 3, I compared it to a Russian VPK-3927 Volk (pronounced as it's spelled, not with an F—it's the Slavic word for "wolf"), which is basically a hardened Humvee. But now I'm upgrading their armor to the level of a Matador MRAP. Of course, since the armor is "adaptive" rather than using static mechanical qualities (otherwise it would be either really dense or too bulky to move in), a whole lot of energy packed into half a millisecond and a circle the same diameter as a pin's head—a laser—can punch through too fast for the structure to "adapt". I think several of the humans' armor-piercing explosive rounds, in rapid succession, can also dish out more energy than the armor can cope with, but for one-hit kills humans still need anti-tank grenades. Speaking of STANAG 4569, I can't believe I've neglected to mention (although I've made oblique references) that a major form of "K-Mart Realism" in my SF is that things are referred to by their ISO designation, if they have one. Prolog, the computer language, is ISO 13211; Unicode, the character-encoding standard, is ISO 10646. There doesn't seem to be an ISO standard for vehicle armor, but personal armor is ISO 14876; I imagine that the ISO of the 24th century will have a vehicle-armor standard, but I'm not gonna say what its number is. Those numbers aren't random, but their system is crazy hard to figure out. It's entirely likely it'd incorporate a (technologically updated) version of STANAG 4569, a lot of ISO standards are just various American or European standards given a new name. This is a thing I prefer to do: when there's already a real thing for it, go with the real thing. The UN's space agency in my books is the Office for Outer Space Affairs, because that's what the UN's space agency is called. The UN's military are the Peacekeepers, because that's what the UN's military is called (it doesn't quite work the same way as now, of course—national armies are more like the "national cadres" in the Soviet Army). The UN's court is the International Court of Justice, and its police are the UNPOL (yeah, they just call 'em "UN Police"—look at it this way, they didn't waste time coming up with a name on the world's taxpayers' dime). I took another look at Mandarin's sounds because I was thinking "it has no phonemic voicing—b, d, and g are actually pronounced as p, t, and k, which in turn are used to write the aspirated versions of themselves—so what are j, z, and zh?" The answer is "the 'ch' in Japanese, 'ts', and 'the unvoiced retroflex affricate' (basically t + the sound of Polish 'sz')", respectively. C, in case you wondered, is "aspirated 'ts'", sh is "the sound of Polish 'sz'", ch is "aspirated unvoiced retroflex affricate", q is "aspirated 'ch' from Japanese", and x is "the 'sh' from Japanese". Pinyin Romanization felt itself free to use unorthodox interpretations of the Roman alphabet, repurposing redundant letters much as the ancient Greeks turned Phoenician consonants Greek didn't have into the first vowels in any alphabet, ever. Turns out, I was wrong. Cats adapt fast to free-fall conditions. I don't know why I didn't search "cats zero-g" before. But apparently, after a brief time when they have no idea what to do, they, like mice and squirrels, just behave normally. Maybe having a much more finely-tuned balance system means they can learn to adapt to free-fall more quickly. This means zled ships can use rotation gravity—which is good, because realistically you probably can't have topology artificial-gravity inside the metric-patching field. The minimum diameter to produce 1.08 Gs (1 G if you're a zled) is 241.449997 meters (yes, I calculated it to the micron), which means the smallest zled ship would be, essentially, a Bernal sphere. The O'Neill Island One has, after all, a radius of 250 m. If we want all of it to have basically the same gravity, limiting ourselves to a rotating band 20 degrees wide, centered on a great circle of the sphere, seems reasonable. On the minimum-diameter sphere, it has a surface-area of 114,650 square meters—which is 28.3 acres, or a bit over a quarter the area of Vatican City. The real trouble with rotation gravity is figuring out how to synch up non-spinning things that dock with the ship with the spin of the spinning part. My calculations say I can probably do it with an elevator as long as the radius of the ship, accelerating all along its length at almost exactly half a zled gravity, but I wonder if I'm not missing something. The rotation even of the big one (909 m in diameter) is still 69.3808 meters per second, which is 249.771 kilometers per hour (or 155.2 miles). Then again the Earth's surface is moving a lot faster than that (depending on your latitude—at the equator, 1/1440 rpm translates to a tangential velocity of 463.8 m/s, 1,669.76 kph, or 1037.54 mph), so maybe it's not a problem? Maybe it can be compared to aerial refueling, and that routinely happens at 315 knots (which is 583.38 kph or 362.5 mph). Speaking of the speed the Earth rotates, the tangential velocity varies by latitude. The circumference of a circle that passes through, say, 28°31′26.61″N, 80°39′3.06″W, is approximately 35,237.49 kilometers (the circle of the equator is 40,075), meaning that its tangential velocity is 407.84 m/s, 1,468.23 kph, or 912.32 mph. That's why space-launches are always toward the east—it takes 408 m/s off the speed the rocket has to accelerate to by its own power. Escape velocity for the Earth is 11,200 m/s, so launching eastward grants a 3.6% savings. That's nothing to sneeze at in rocketry.